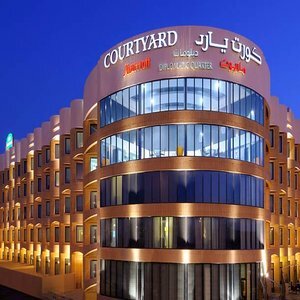 Experience the utmost in hospitality at Courtyard Riyadh Diplomatic Quarter. Considered one of the top business hotels in Riyadh, Saudi Arabia, we offer our guests convenient access to the business, government and financial districts. The new state-of-the-art lobby, in our Riyadh, Saudi Arabia hotel, provides greater flexibility and choices for our guests. At the center of it all is Olea - CafÃ©, Kitchen and Lounge. It is your destination for a great breakfast or dinner and drinks during the evening. You'll also enjoy inviting, flexible spaces where you can work or relax throughout our hotel in Riyadh, Saudi Arabia. Plus, our well-equipped fitness center, indoor pool and whirlpool will help you stay refreshed and energized. Whether traveling for business or pleasure, your stay at one of the premier hotels in Riyadh is sure to be more comfortable, more productive and more enjoyable than ever before!